…and the old woman, dressed only in raggedy tenny runners and a nightgown, tripped over a tangle of barbwire and fell into the rocks. 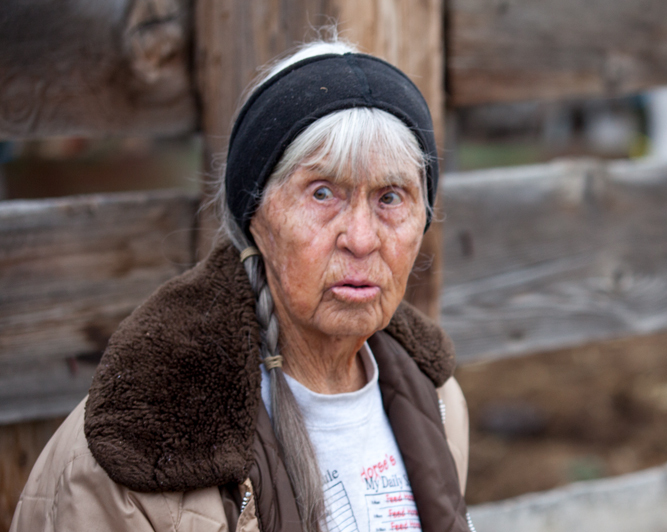 Her neighbors call her ‘Old Lona’ and say she’s no bigger than a bar of soap. Just under five feet tall and barely outweighing a hundred pound sack of chicken-feed, this octogenarian lives alone, deep in the desert—with her cattle, range horses and beloved dog. 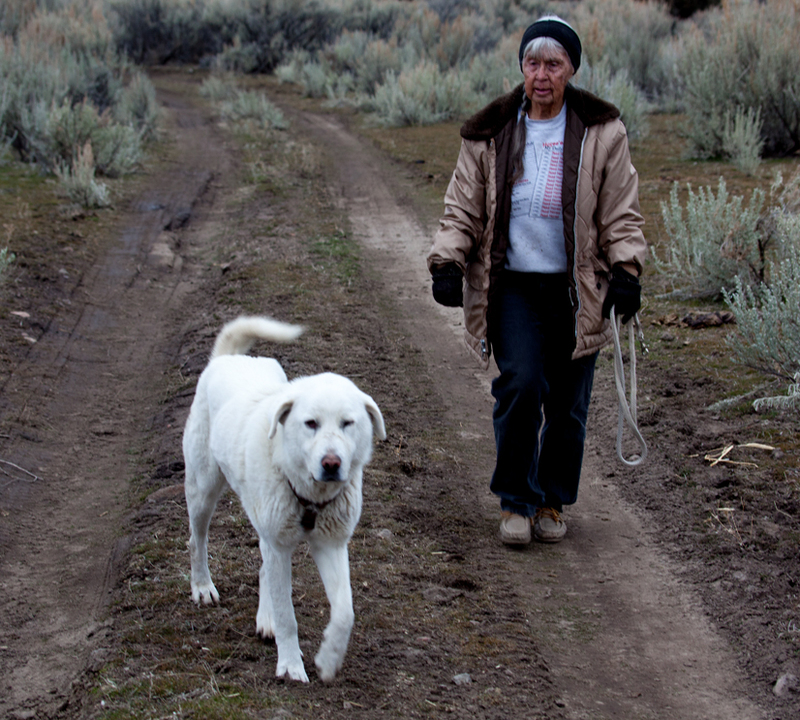 Molly is a young livestock guard dog who weighs almost as much as her owner. Her job is to take care of Lona. Where one goes, the other’s nearby. When bored, her favorite game is blocking her master’s path while looking back expectantly over her shoulder, trying to entice a game of work glove keep-away or friendly wrestling match. “I don’t have time to play, you silly dog,” she says, ruffling the canine ears. Lona was worried about a missing heifer with a brand-new calf. Bedtime came and she stepped out into the yard looking for the bovine pair. Nothing. She headed for bed. Unable to sleep or quit worrying about the calf, she climbed back out of bed on that lovely summer night and gra bbed a flashlight. Then she followed the Milky Way into the dark looking for that young cow. Molly stretched in her bed near the lilacs and trotted along behind. Two hours later, Lona was edging around a brush pile when she tripped on a wad of barbwire. Sitting up in the pile of rocks, she knew she wasn’t seriously injured. But, all those years of hard work had taken their toll: she’d badly bruised an already gimpy shoulder and was unable to get back on her feet. Every time she tried, Molly stepped in front, stood cross-bodied, and looked back expectantly. “I don’t have time for this!” Lona yelled, pushing the dog away. Tears flowed. It’s a quiet and creeping vulnerability that builds in the dark of night when an aging and partially clad woman is injured, unable to move, and no one knows where she is. Panic saps vital energy as it seeps into the widening cracks of an otherwise strong personality. Still, every time Lona tried to rise, Molly blocked crosswise and looked back expectantly. Energy flagging, Lona rested one hand on the dog’s shoulders. Immediately, Molly spread her front paws and braced herself. Lona paused, then experimented. With one arm, she leaned, wriggled and squirmed into a kneeling position. Then, using the dog as a brace, creakingly climbed to her feet. Slower than a snail makes a trail, they tottered home with Molly acting as a crutch on her friend’s injured side. “I didn’t understand what you were trying to tell me,” Lona said, giving the dog a heart-felt hug with her good arm. Then, she fixed a hot cup of tea and plunked down in her favorite rocker. As adrenalin quit flowing, her body relaxed. Head drooping, she drifted into a much-needed, healing sleep. Lona’s cold tea was still by her side when first light touched her window. Wobbling across her living room floor, she opened the front door. The heifer and her healthy calf were grazing on the front lawn. Then she made her way over to the lilacs where Molly was snoozing and gave her a big hug—with one arm. These days, Lona is healing well and Molly’s not confused about the new abundance of one-armed hugs. She’s adapting to the extra attention and doesn’t need to say much, as long as she’s with Lona. Last winter, three years after this story took place, Lona passed. Her death wasn’t unexpected. But, it ripped up the roots of Molly’s life with her friend. Since that time, Molly has found a new home. 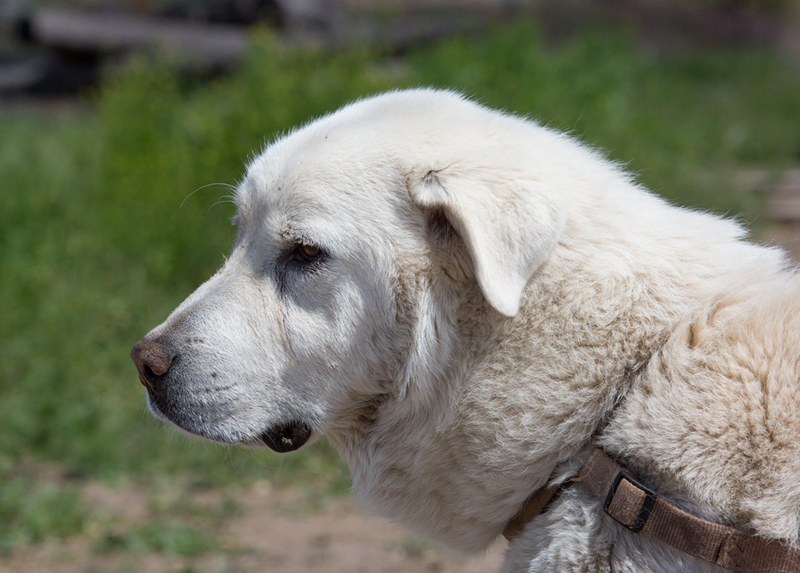 She has owners who love her and a job to do: guarding piglets from predators. At this writing, Molly is still grieving the loss of Lona, but she’s showing signs of adapting to Paul and Le slie. To keep the dog from wandering in search of her long-lost friend, the new owners have tied her near the pigpens where she watches over her new charges. She’s adopted a horse trailer as her very own house—complete with humongous dog bed—to give shade and a break from the howling winter wind. About two months after Molly moved to her new home, Paul and Leslie were away from the pig farm when they got a frantic call from their caretaker. Neither, Paul, nor Leslie was sure what to do or where she’d go. An hour later, they got a much calmer phone call. So Molly is still having a tough time, but new owner and dog are working out their differences. Maybe best of all, in the meantime, she has a job to do and pigs to guard.